Is there a better alternative to ZenTask? Is ZenTask really the best app in Applications category? Will ZenTask work good on macOS 10.13.4? 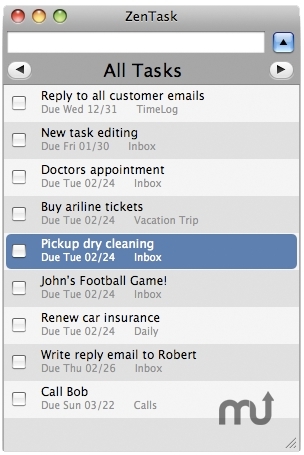 ZenTask is a light weight task/list manager that allows you to keep track of lists or tasks easily. If you need a quick an easy way of keeping things off your mind, ZenTask is perfect for you. The user interface has been design to be simple and very easy to use. If you want speed all functions in ZenTask can be accessed using keyboard shortcuts. The next update will include iCal Sync, Menu bar integration and manual sorting/ordering. Supports Wi-Fi syncing with iPhone version. ZenTask needs a rating. Be the first to rate this app and get the discussion started!